Matcha, matcha, matcha. You may have noticed matcha green tea is everywhere these days. From matcha lattes at your favourite coffee shop, to matcha desserts at sushi restaurants to matcha green tea ice cream, this green powder is definitely having a moment. The best part about matcha is you don’t have to wait to go to a cafe or restaurant to get your fix. You can make matcha recipes for yourself in the comfort of your home. Just make sure to buy pure, organic matcha to reap it’s amazing benefits! What is Matcha Green Tea and Why is it So Popular? Matcha is a finely ground powder made from green tea that is (mostly) grown in Japan. There are two main aspects that make matcha green tea stand out: (1) The tea plants are covered with shade cloths before they’re harvested, which gives them superior flavour and texture; (2) The leaves are hand selected, steamed briefly to stop fermentation, then dried and aged in cold storage, giving them even more flavour. With matcha, you’re drinking the actual leaf, which means you’re absorbing more of its benefits. It’s one of the most flavourful, tasty and good-for-you teas you can drink! There’s an art to making matcha, and it’s quite simple once you get it down. You’ll need a matcha bowl, a matcha whisk and a sifter. First, sift 1-2 teaspoons of matcha powder into your matcha bowl. Add about 2 oz of hot water (just under a boil), then whisk in a zigzag motion until it’s frothy. Pour it from the bowl into your favourite mug, and easy as that, you have your perfect cup of matcha tea! Matcha Green Tea Benefits You’ll Love! Along with being tasty and easy to make, there are a bunch of benefits of drinking matcha green tea! Take a look at 5 matcha tea benefits below! A Boost of Antioxidants. Matcha green tea is made from high quality tea leaves, and is chock full of antioxidants. Since you’re consuming the whole leaves, matcha delivers a high antioxidant count to your system. The antioxidants found in matcha are called catechins and are linked to protection against heart disease and cancer, blood sugar regulation, blood pressure reduction, and anti-aging. Antioxidants can also boost your metabolism, prevent cell damage, and flush out toxins in your body. A Healthy Alternative to Coffee. Matcha is a healthy alternative to coffee, offering three times as much caffeine as a cup of steeped tea, since you’re consuming the whole leaves. This equates to about the same amount of caffeine in a cup of coffee. On the plus side, instead of getting jittery or that buzz you get from coffee, matcha makes you more alert, with a sense of calmness. It contains l-theanine, a natural substance that makes you feel relaxed, but not drowsy, so you can get the best of both worlds. Increases Energy Levels. Along with caffeine, matcha also contains nutrients, antioxidants and amino acids that help boost your energy throughout the day. The antioxidants found in matcha rid your body of toxins and impurities that make you feel sluggish, and the effects of matcha can last for up to six hours. L-theanine ensures there’s no side-effects of stimulants like nervousness and hypertension, so you’re getting energy in its cleanest form. Aids with Weight Loss. ECGC, one of the potent catechins in matcha green tea, has been linked to potential weight loss benefits. Matcha is low in calories and helps increase your metabolism, burning fat four times faster than average. It also helps reduce fat storage. The weight loss effects of matcha may be slow, but they are significant in the long run. The best results will be seen with healthy diet and exercise! You Can Incorporate Matcha Easily Into Your Meals. Since matcha is a powder, it’s easily incorporated into your drinks and meals. You can easily use it when you cook, in sweet and savoury dishes. From lattes and fruit iced teas, to muffins, stir fry and guacamole, here are the best matcha green tea recipes to start using in your day to day life. These recipes are some of the best ways to incorporate matcha into your every day life. With so many health benefits, it’s time to start drinking and eating more matcha! 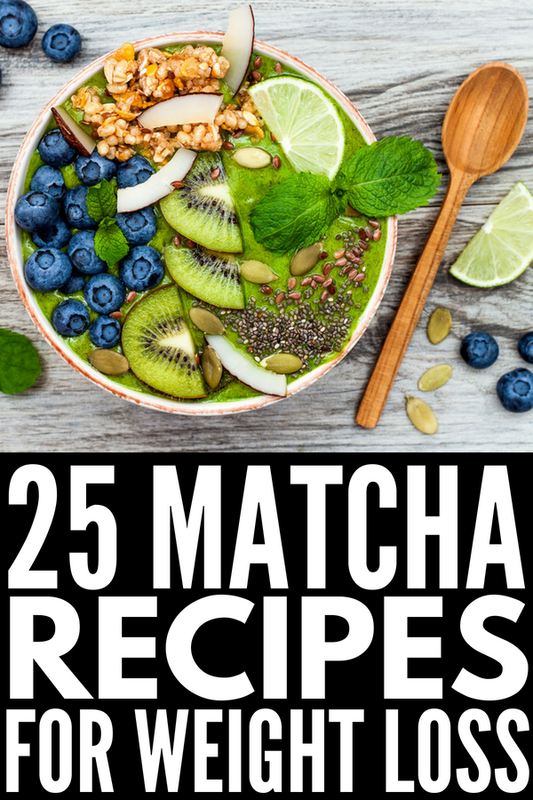 If you love these matcha recipes and tips as much as we do, please share this post on Pinterest. And if you want more health tips, follow our Health Board on Pinterest.